Amy Murphy is excited about the prospect of seeing what Kalashnikov can do over fences this season, with the Racing Post Arkle at Cheltenham already circled in her diary. Based in the heartland of British Flat racing at Newmarket, Murphy was thrilled to find 'a gem like Kalashnikov' in her small jumps team last season. Last year we only had eight jump horses, so to have found a gem in Kalashnikov is unbelievable. Having impressively won the Betfair Hurdle at Newbury in February, he went to Cheltenham in March and ran a blinder to be a neck-second in the Supreme Novices' Hurdle behind Summerville Boy. Murphy couldn't have asked any more from either horse or rider Jack Quinlan in the Cotswolds and she was delighted with the campaign overall. "Last year we only had eight jump horses, so to have found a gem in Kalashnikov is unbelievable," said the trainer. "The Betfair was very surreal for me as the likes of Willie Mullins and JP McManus have been idols to me and for them to turn around and be congratulating us made it a special day. "Jack (Quinlan) rode to an absolute tee at Cheltenham. He couldn't have done any more to help the horse. It was a big day for a team of our size to be competing at Cheltenham with a live contender, and to run like one - it was a phenomenal day." Murphy went on to describe Kalashnikov as a 'big, raw horse' that will have needed his summer break before coming back to go chasing this season. He may start off over fences at Plumpton, with a lucrative bonus offered should he score there and go on to win at the Cheltenham Festival in March. "Fences are what he is bred for. When you have a live contender for Cheltenham I think you would be mad not to look at a race at Plumpton with the bonus they have (for going on to win at Cheltenham)," Murphy added. "He will start off low key and if Plumpton fits, then great. 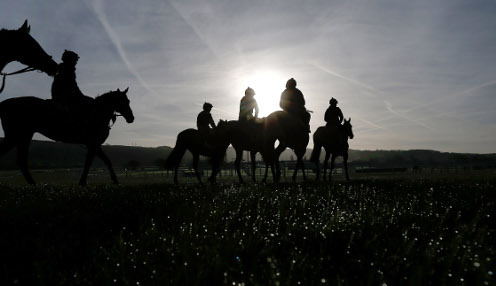 Everybody wants to be at Cheltenham and that will be our target again." Kalashnikov is 9/1 to win the Arkle at Cheltenham this season, with Summerville Boy priced at 999/1 and Gordon Elliott's Samcro 999/1.